The Crown of the Continent Ecosystem sits at the heart of the Yellowstone-to-Yukon continental corridor. It extends from the southern Canadian Rockies in British Columbia and Alberta southward along the Continental Divide into Montana, encompassing about 72,000 km2 (28,000 mi2). This rugged, beautiful landscape harbors perhaps the greatest diversity of carnivores in North America and the last remaining stronghold for several native fish and wildlife that have been vanquished elsewhere. Because these species do not recognize jurisdictional borders, it’s imperative to conserve this landscape as one ecosystem. With its complex topography, range of elevation from prairie to peak, and various ecological zones, the Crown of the Continent provides important options for plants and animals to shift in response to climate change. The Crown also is the headwater source for several of the major rivers that provide precious water across the continent. Map: Crown of the Continent Ecosystem as delineated by the Crown Managers Partnership and produced by the Miistakis Institute. Expanding industrial activity, natural resource extraction and increasing motorized recreation are intensifying human disturbance and diminishing security for vulnerable species across the region. This has fractured the landscape, leaving few safe havens for security and safe passages for movement in the midst of resource development and a changing climate. On the Canadian side, there is little formal protection of these ecologically valuable wildlands other than Waterton Lakes National Park. On the Montana side, successive generations of citizens and government leaders have worked for more than 100 years to designate Glacier National Park, world-class wilderness and wild and scenic rivers, and protection of critical habitat for fish and wildlife on state and private lands as well. These collective achievements constitute a remarkable legacy and great gift … but, in the face of continuing pressures of industrial development and new challenges like climate change, it may not have been enough. Going forward, a smart strategy for resiliency in changing times is to protect and connect large landscapes that have high topographic and ecological diversity to provide safe havens and safe passages. WCS carries out science and conservation on native species that are vulnerable to pressures on their habitat and populations - including grizzly bears, wolverines, mountain goats, bighorn sheep, and bull trout and westslope cutthroat trout. Collectively, this suite represents a broad diversity of terrestrial and aquatic habitats at a large landscape scale. We use field-based studies and landscape-scale modelling to identify the most important areas to conserve and to inform discussions and decisions on protecting vulnerable wildlife and wildlands. To help implement these scientific results into decisions, we collaborate with the public and private sector - especially local communities - to find land use planning solutions. Our goal is to protect and connect a network of critical wildlands that support a diversity of wildlife with room to roam as they respond to changing conditions. WCS has been actively working to identify crucial habitats for vulnerable fish and wildlife, with particular emphasis on remaining wild lands in the Crown of the Continent. For each of the six focal species, we compile and synthesize the latest available data on their distribution and habitat use to identify and map important areas. In some cases, we conduct field studies to fill in gaps of information. We use regional projections of climate change to identify where suitable habitats may occur 50 years from now. This way, we highlight key areas that need to remain connected to maintain the well-being of these species into a changing future. Based upon these scientific assessments and field reconnaissance, WCS recommends a portfolio of wildland protections to safeguard these species and landscapes. Landscape linkages or corridors across major highways are vital for safe passage across fragmented landscapes and for adaptation to changing climate conditions. WCS scientists are using the latest computer software to identify likely linkages across major highways and mountain passes in the Crown of the Continent to promote connectivity at a regional scale. A few highways running east↔west across the narrowest section of the Crown of the Continent pose a major fracture to north↔south connectivity – including Highway 3 (Crowsnest Highway) in Alberta and B.C. and Highway 2 in Montana along the south side of Glacier National Park. WCS has identified key linkages for carnivores – especially grizzly bears and wolverines – across these highways. To inform discussions and decisions about wildlife and wildlands in the Crown of the Continent, WCS strives hard to get this extensive information out to a wide variety of agencies and public audiences. 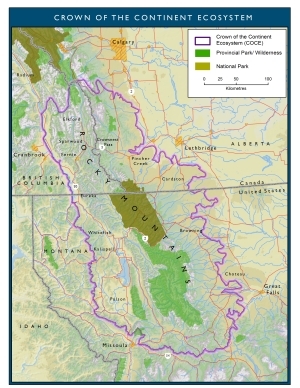 Thus far, we have produced six major WCS Conservation Reports about vulnerable fish and wildlife in the Crown Ecosystem – two for the Montana side, three for the Canadian side, and one trans-border. Downloadable PDFs of these reports are available from the "Latest Publications" section of this page. Safe Havens, Safe Passages for Vulnerable Fish and Wildlife. Critical Landscapes in the Southern Canadian Rockies, British Columbia and Montana.